Chimneys are an integral part of the roof system. 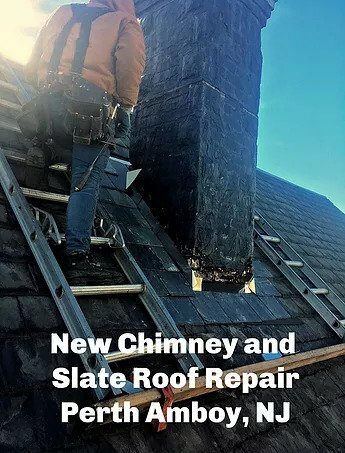 While they function as ventilation for steam and gases created by boilers, furnaces, hot water heaters and fireplaces, their exterior maintenance is best handled by an experienced roofer. 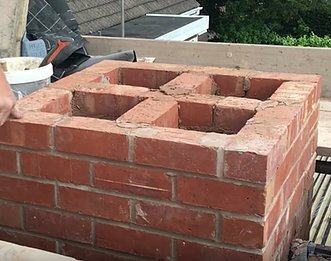 That’s because the exterior of the chimney needs to be seamlessly tied into the roof or it will become a source for water to penetrate the roof and into the home. 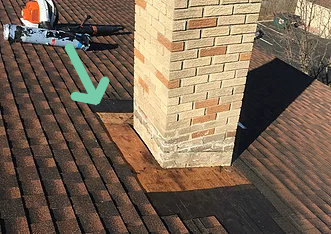 The key is to properly seal the area around the base of the chimney where it meets the roof. There essential two types of materials we use are a tar based flashing, or even more effective copper flashing. 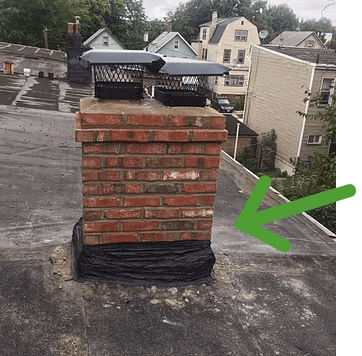 Michael J Harris has successfully repaired and replaced chimneys throughout New Jersey in towns like Maplewood, South Orange, Short Hills, Jersey City, Perth Amboy, Montclair and Edison. 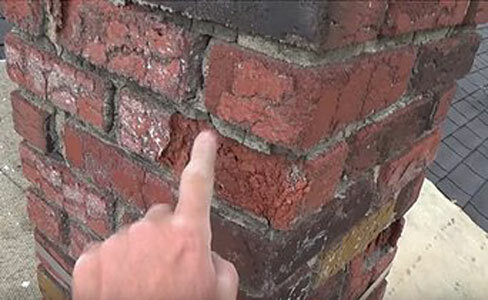 Because most residential chimneys are made of bricks, they need to be repaired or re-built by a mason. Since they are set into the roof, they also need to be re-built or repaired by a roofing expert. That’s why Michael J Harris Roofing and Masonry is the ideal company for your chimney needs. 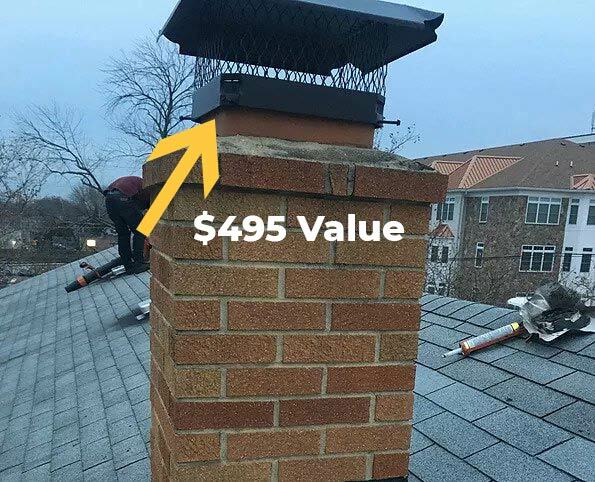 The chimney flue is ceramic and is lined with aluminum. Over time, flues need replacement because gasses are emitted every time the washing machine, dryer, dishwasher or hot water heater is used and it erodes the material. We often replace the flues as well. To rebuild the chimney, we use bricks and mortar carefully leveling and measuring as we go along. The homeowner can chose the style and color of the brick they feel best enhances the look of their home. After the masonry is complete we examine the roof deck to see if needs to be replaced. If the wood holds any moisture or is bowing or buckling, we remove and replace it. Next, we lay down an underlayment over the deck that prevents water from penetrating the roof. Called “Ice Shield,” we only use the one made by GAF. Ice / Water Shield are now mandatory in the New Jersey residential roofing code on all new chimneys. It is an extra layer of protection and is placed 3 feet around each side of the chimney. Lastly, the shingles, and flashing and chimney caps are installed. There are several types of flashing. 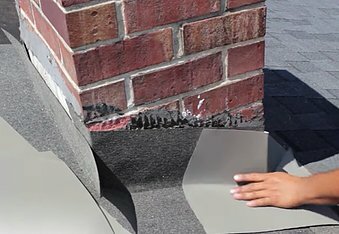 There is fiberglass fabric covered flashing which requires roofing cement to adhere it around the chimney. Or, there is and copper or aluminum. We will advise you what we think will be best based on your needs. We just re-built this chimney on a home in Bloomfield, NJ. We used a fiberglass fabric covered flashing with Karnak roofing cement. Karnak is the best made roofing cement in the business. 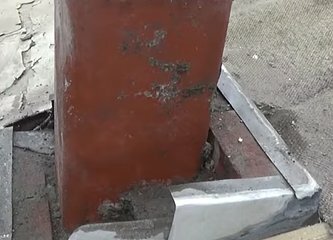 Together the flashing and the cement will seal the chimney preventing any further leaks. If you witness any moisture coming through your ceiling around the chimney or see visible signs of decay on the exterior of your chimney, call Michael J Harris Inc and we can provide you with the very best service to ensure your chimney is operating properly.